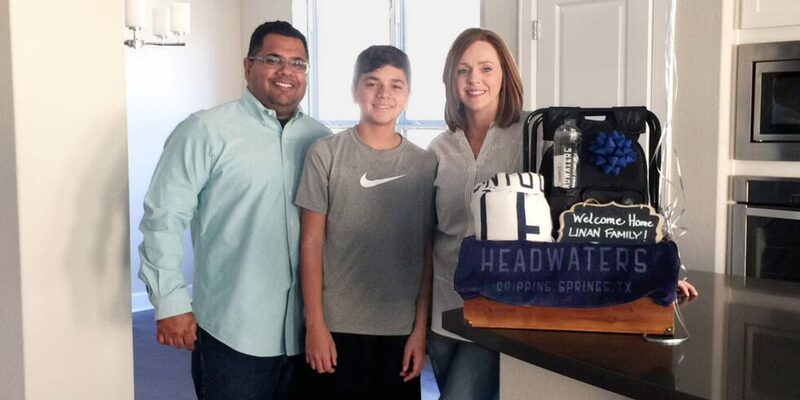 Headwaters is excited to welcome the Linan family to the community! After years in the Marine Corps, this family of three chose to make Dripping Springs their home, but the Linans found themselves wanting to be part of a growing community with plenty of amenities, a great location and breathtaking views. When they toured Headwaters, it was love at first sight. “It was completely different from any other community we looked at. My wife fell in love with it. My son fell in love with it,” says Alex Linan. When searching for their new home, the Linan family toured many other communities in the area. What made Headwaters different was the chance to be on the ground floor of a new, growing community with plans for the future. “It was the opportunity to move in to the first phase and be some of the first residents and enjoy the growth of the community,” says Alex. Beyond the growth opportunities, they were also looking for the right home in the right location, and Headwaters fit the bill. When they toured the model homes last January, they fell in love with the proximity to Austin and the Craftsman style homes offered by Headwaters’ builders. “The Craftsman style, which is new to the area, most houses in the area don’t carry that Craftsman look or that Craftsman feel,” says Alex. They were also happy to know that Headwaters residents have access to the top-rated Dripping Springs ISD, where their son, Brendan, was already attending and involved in sports. The Linans are particularly excited about all of the amenities that Headwaters offers. “When I talked to my friends and family about the amenities and what they offer – it just really blows away a lot of the other communities that we looked at,” says Alex. They were surprised and happy to learn that the lifestyle programming is tailored to residents’ interests, and shortly after purchasing their home they were able to provide their input on what kinds of programs and events they would like to see. They’re also looking forward to the more than 8 miles of trails and 700 acres of open space, because they have a couple small dogs and enjoy taking walks as a family. They’ve even purchased a telescope, and are thrilled to use it at the stargazing amphitheater. Featuring amenities with a focus on health and wellness, Headwaters is ideal for outdoor enthusiasts and active families. With more than 8 miles of trails winding throughout the community and hundreds of acres of preserved open space, residents are connected not only to nature but to each other. Between HW Central and HW Fit, residents have access to resort-style amenities like a split-level pool with panoramic views, splash pad for the kids, state-of-the-art fitness center, and a Wi-Fi Café, with even more to come in future phases. Come see what made the Linan family choose Headwaters as their new home. Models are open Monday through Saturday from 10am to 6pm and Sundays from noon to 6pm for tours. And make sure to join our Founders Club, so you’ll always stay up-to-date on Headwaters news.